In Yellowstone Park on a sunny August afternoon, I sat and waited for the iconic geyser, Old Faithful to do its stuff. Shortly my expectations and those of hundreds of others were met as the geyser spewed steam and hot water into the air. The event lasted about ten minutes. Even though the eruption was an amazing natural phenomenon, Old Faithful is not the biggest, nor most impressive among all the geysers in that famous park. Yet, it has something that none of the others have. Something that draws the biggest audience. Old Faithful is dependable. After years of observation, the scientists can predict when the geyser will perform. In fact, so dependable is the miracle, that the park posts the estimated time of each eruption. Accompanying me to watch this wonder was my twenty-three year old daughter. 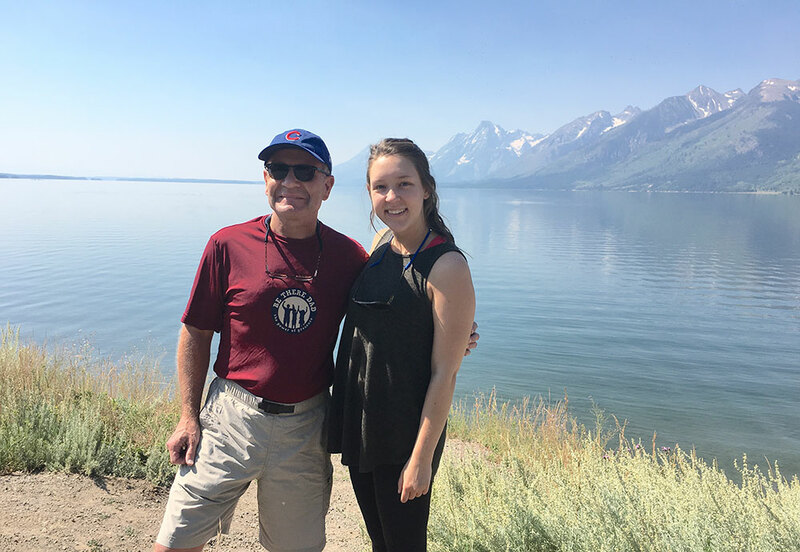 She and I were spending some father-daughter time in the Grand Teton and Yellowstone National Parks; and this was our obligatory time to watch the most famous attraction there. Eventually we would hike mountain trails, float down the Snake River, kayak on a mountain lake and spy a wild moose. For me, it was Be There Dad time at its best. Old Faithful. On the first day of our time together, I thought maybe it was a sign intended for me. Perhaps this was a revelation of what I have become. In Be There Dad, I explored the evolution of a dad’s presence in a chapter called A Drink of Dad – caring, nurturing, encouraging, and supporting. Now, I realized I was adding another stage. Dependable. Several months ago my daughter shared with me her plans to visit college friends in Denver. 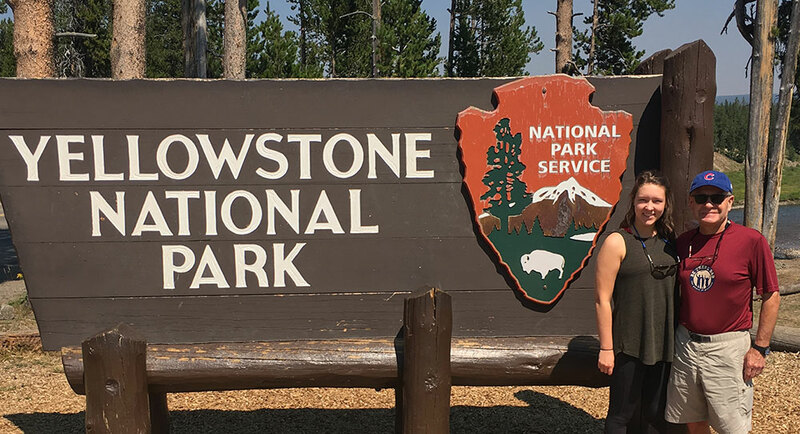 After a long weekend there, she suggested that while she was “in the area” she might spend the rest of her vacation week on a first time visit to the national parks in Wyoming. Then came the moment that took me by surprise. She added, “I need someone to go with me, so would you meet me there? Would you like to hike in the mountains with me?” It only took a nano-second to consider my response. And so, the anticipation and planning began – collecting frequent flier points and making reservations. Looking back, I know now that my daughter was confident of the response she would get from me. A relationship based on hours spent together screaming on roller coasters, hitting volleyballs, walking on the beach and watching classic movies assured her that I would likely say “yes”. To her, I have become Old Faithful. Not the biggest dad. Not the most impressive dad. But, perhaps the most dependable. Always there. Ready to do my stuff. This time it was hiking, paddling and exploring. Old Faithful – the next stage of my Be There Dad journey. Grown and living away from home, my daughter has best friends she depends on. She has a circle of young people with whom she socializes. She interacts with co-workers in her office. She has a full and active life. She calls her mother regularly and they chat about her life. Mom still offers advice. Most of her needs are satisfied by other wonderful people, so she doesn’t need me very often. But occasionally, when the time and situation are right, she calls on me. She knows there is something unique about me. I will always be there. During the next few days as I followed my daughter up serene wooded trails or we paddled a kayak on a placid mountain lake, I thought how blessed I was to be in this stage of my life. When the path widened and we walked side by side, or we drifted on the lake, we talked about a hundred things. Some mundane. Some more thought provoking. Some about the past and some about the future. I heard about her day-to-day life, some feelings, some questions and some dreams. I now know the name she has already chosen for her first dog; her new favorite foods, and recent thoughts about her career. Once there was a chance for me to add a bit of wisdom. We shared some hearty laughter. We marveled at the awesome views. And often, we were just quietly in each other’s presence. In three days, we shared once in a lifetime moments. Among them, one evening at twilight, we stood on a bluff and watched patiently for a bull moose to reveal his huge antlers in the willows just a few hundred yards away. Really? How cool was that? A new experience of each of us. Another bit of family folklore to recall repeatedly at Thanksgiving dinners. A memory shared by only her and me. I have written yet another chapter in my Be There Dad memory book. Spectacular photos saved on my smartphone will some day be deleted, but the images in my mind and the feelings in my heart will last my lifetime. Twenty-three years of presence had led to these moments together. In the wilderness of Wyoming, I came to understand how my place in my daughter’s life continues to evolve, yet how the essence remains the same. Present. Dependable. I am happy to still be a part of her life. Whenever she needs me, I will be there. Old Faithful.